Please refer to our stock # 11542 when inquiring. This unique bracelet was designed by modernsit jeweler, Arthur King. It is 8" long x 3/4" wide and has caged raw stones set in intricately wrapped sterling silver. 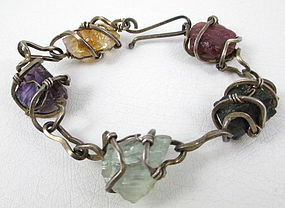 The stones include tourmaline, amethyst, citrine and quartz. The hook closure is signed "King Sterling". It is in excellent condition.